A medical writer for 25 years, Cheryl Jones assists researchers in writing articles for various medical journals, including the "New England Journal of Medicine" and "Headache." Her news articles have appeared in specialty publications, such as "Infectious Diseases in Children," "Ocular Surgery News" and "Hem/Onc Today." Jones holds a Bachelor of Arts in journalism with a minor in biology from New Jersey's Glassboro State College. Tooth loss is unpleasant to face, but well-fitted partial or full dentures can be indistinguishable from your natural teeth. Dentures are available in several types of materials, including porcelain, acrylic resin and composite resins, with porcelain and acrylic resin being the most common. Selection of the most appropriate material for your needs involves careful consideration of wear, durability and maintenance. Porcelain is a harder substance than acrylic, making porcelain teeth more durable, says DentureHelp. Because porcelain teeth resist wear, these dentures preserve the normal jaw movements and alignment for a longer period. Acrylic teeth are susceptible to abrasion, explains iDentalHub. Acrylic teeth will wear down with time, causing changes in the length of the teeth. Porcelain teeth are more prone to chips and cracks compared with acrylic, notes DentureHelp. Acrylic teeth are less likely to break or develop fractures. Acrylic dentures may be a better choice than porcelain if you need only a partial denture and your false teeth will meet against your natural teeth. Porcelain causes excessive wear on natural teeth. Acrylic teeth are preferred for people who have bone loss in their jaws or unhealthy gums, suggests DentureHelp. 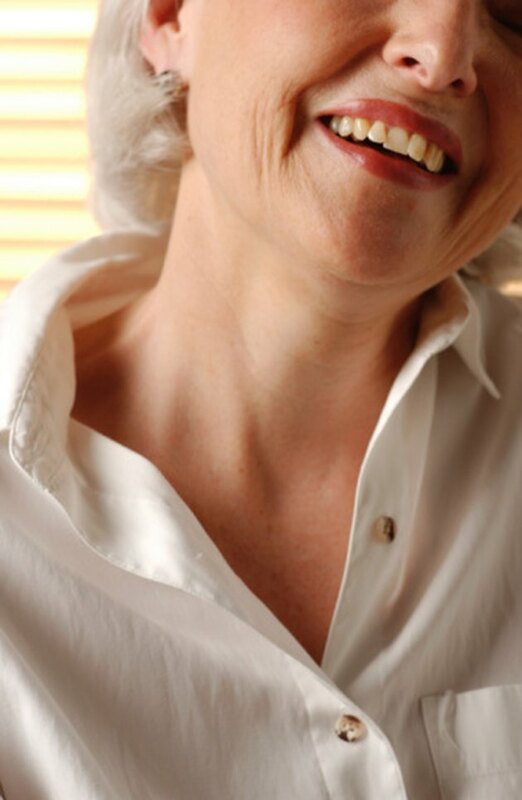 Chewing puts pressure on the dentures, which transfer that force to the bones underlying the gums. Constant force can change the underlying bone, which can affect the bite, or occlusion, of the dentures. If the dentures do not meet properly when you bite down, the unbalanced pressure may cause further damage to the bone. Porcelain transfers that force with greater intensity than acrylic teeth. Acrylic also transfers less pressure from habits such as grinding, clenching or tapping teeth. Acrylic teeth resist staining, but they contain microscopic pits that can hold bacteria, explains dental hygienist Clare Van Sant on the website Dental-Professional. Brushing or quick soaking do not effectively remove the bacteria, although overnight soaking does thoroughly clean the dentures. The bacteria remaining on acrylic teeth can multiply rapidly and cause infection or bad breath. Porcelain dentures must be handled carefully during cleaning. Porcelain dentures should be cleaned over a sink filled with water or over a towel to reduce the risk of chips if the dentures slip and fall, says DentureHelp. Porcelain and acrylic dentures are comparable in price, notes DentureHelp. Acrylic dentures are more quiet, similar to natural teeth, whereas porcelain teeth may cause a “clacking” sound during chewing. Acrylic and porcelain dentures require regular checkups to ensure proper fit, although acrylic dentures will wear sooner.